Sharper vision in a thinner, flatter lens. Thinner profile is simply more attractive. high index material, patients benefit from wearing this premium 1.74 index lens. As the index of refraction increases, the curvature needed to produce a specific correction decreases. The result is a flatter, more attractive, lower volume, thinner lens than was previously possible. Higher index materials have given patients, especially those with large refractive errors, freedom to choose lens sizes and shapes, as well as frame styles, that were once unavailable to them. 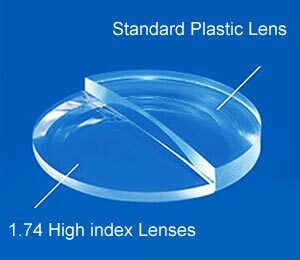 When these high index lens materials are used in aspheric, atoric, or progressive designs and paired with premium lens treatments, the value to you, the patient, expands dramatically.